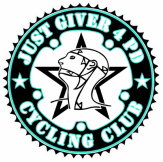 Join Just Giver 4PD Sunday, June 5th (rain date changed to June 26th) as we tackle the 4 Peaks of SFU, Seymour, Grouse and Cypress while raising awareness for Parkinson's disease. This 140 kilometer ride with 3,000 meters of climbing will test the early season legs! This year we will be increasing the climbing by riding to the very top of SFU! For more information, visit our event info page. Participants can do all or part of the ride.